What with gas prices being as high as they were this summer, we didn’t go on as many road trips as we would have liked to. 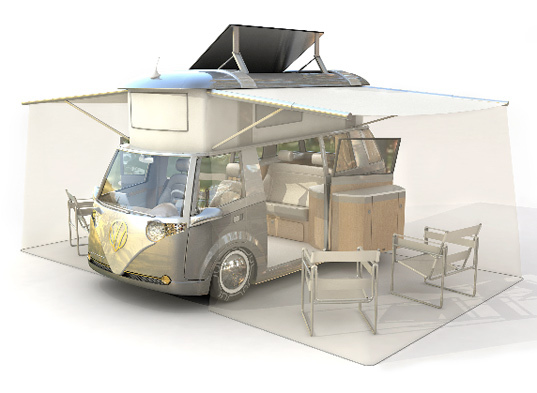 If we had a camper like the Verdier Solar Powered Camper, we definitely would have embarked upon more road trips to beautiful National Parks and done it in eco-style. Verdier’s eco-RV is based upon a classic VW Westfalia that has been upgraded with many green elements, like a hybrid engine, solar panels and a lot of high-tech systems that makes this bus a hippy’s Pimp My Ride dream come true. The Verdier Camper comes in comes in five different models designed for your own unique personality: Woody, Geeky, Ebony, Blueberry, and Purity. Each camper comes equipped with a 4-cylinder hybrid engine, powered by a 170 W solar system on the roof. If you’re driving a lot or if the sun just isn’t shining enough, you can fill your tank with normal gasoline to make it to your next sunny local. The solar panels are controlled by a GPS system to optimally orient the panels to the sun and can tilt up to 45 degrees in two directions. Two deep cycle batteries hold the charge. This camper excels in making every space count for something, whether it is storage, beds, a fold-out kitchen or even stairs built into the back of a chair to get to the bed above. We were very impressed by the built in containers for trash, recycling and composting, as well as refrigerator/freezer combo. Our favorite feature though is the on-board entertainment center, complete with a projector, 6 speaker surround sound, and a roll down screen. You may be camping, but that doesn’t mean you can’t kick back and chill with a movie. The most useful feature of the Verdier is probably the on-board computer built into the front passenger dashboard. The PC tablet let’s you get online to check email, listen to music, surf the web and chat online. The GPS software takes care of navigation, and exclusive software lets you find nearby activities and supplies, as well as monitor your camper’s energy and fuel supplies. Plus, you can take it with you by removing the tablet from its base. The camper’s price certainly isn’t in most of our budgets, at $129,000, but when you compare this to one of those big lumbering RV’s, it’s a steal and a lot more environmentally friendly. Verdier is currently taking reservations for these amazing campers, and should have yours ready just in time for summer road trips in 2009. Their video is pretty cool as well. are there already manufactured some of these? So with the video and link down, I assume they never actually moved from design to manufacture ? 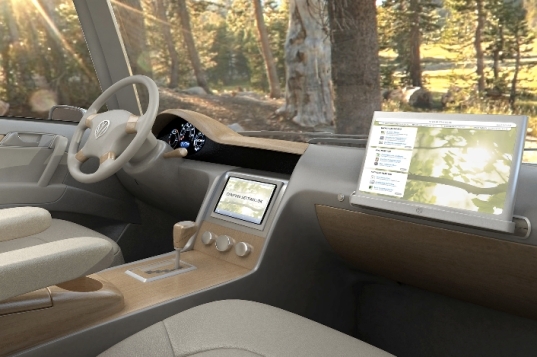 Someone is going to chop a wrecked prius and turn it into a pop up camper. I doubt they will have water and shower or a potty those things are nice but I feel is not worth the fuel hit to carry the additional weight. We need a comfortable place to bunk I would be satisfied with a climate controlled hammock hang. Design it where you park near a tree or an anchor point and you should be able to use that anchor point to run a frame out to add hammock chairs in the screened shaded space. looks very nice and has some great ideas ie solar panels etc but one does not need all that techy stuff. One is to go camping to enjoy the outdoors not look at computor and watch movies etc. Too low to ground for gravel roads. Too expensive for average person. Should have a basic model for average person but not a hippy type. ha! what a cool idea. Its perfect for the new aged, tech savy "hippy"
Say, could you paint one of these buggies robins egg blue and put a Dharma Initiative logo on the front hood ( or hatch if you like). Of coarse you would sell such a micro bus with a set of D.I. jumpsuits and a couple of D.I. six packs in the fridge. Put a P.A. system on the roof and you could drive around the "hood" announcing " the swan is going to blow brothers!!!". P.S. DON\'T DRINK DHARMA BEER AND DRIVE!!! I agree with MadroneZone, in that its not so great to only show photoshop's capabilities. Also, if the designer is going to all the trouble of modding up such a dream, why put some ugly panel on top? Why not add a cool looking panel? I have to finally chime in. This "product", like so many shown in design mags/fora lately, is so completely virtual that it exists primarily as a proposal, a fantasy, a futuristic dream. CAD software and rendering technology has made it possible to image concepts to a high degree of apparent finish, but much stands between a gorgeously rendered glossy of a design concept and its proof: the final, physical product. I'm glad someone is thinking about this, and about self-sustaining prefab homes, and solar cars, and everything else. That's why I like Inhabitat. But it really dilutes the impact of a report when we are left realizing that it has never been, and might never be, constructed in the real world. Student projects appear every year imagining such fantastic uses of new technology, but on the ground, where we're still dealing with existing building codes, aging infrastructure, and limited means, it's almost insulting to discuss "green" projects that essentially sidestep any involvement in the real world. A lovely website with perfectly-rendered 3-D images does not a green product make. Please, keep track of stories like this, and the yellow chrysalis restaurant in the trees, but identify them as concepts; visualizations, rather than completed, real projects. When they are completed and functioning, then graduate them to "real" status. At that point, there will also be more to report, such as actual energy use, battery life, final cost, availability, and user feedback. Is this for real? Have Verdier answer that. Please. The only green consumer is a dead consumer... What's the carbon footprint of making one of these things? Excellent idea! I believe that solar will be able to play a big part in reducing our transport emissions. I am currently modifying a 1989 Toyota Landcruiser to drive from London to Cape Town raising money the charity Solar Aid. The power steering, cooling fan, water pump and all other electrics will run off Solar - hope raising efficiency by around 10%. I am using thin film Solar -which is light weight and flexible - and just be able to stick on the body work. Search "Overland in the Sun" to find my website. This is very attractive, but I wonder about the ratio of energy use to weight. Batteries are heavy, and solar power may only provide enough energy to transport the weight of the battery. I think this may be the image more than it is the practice of sustainability. Love it. Send me one right away. What with gas prices being as high as they were this summer, we didn't go on as many road trips as we would have liked to. If we had a camper like the Verdier Solar Powered Camper, we definitely would have embarked upon more road trips to beautiful National Parks and done it in eco-style. Verdier's eco-RV is based upon a classic VW Westfalia that has been upgraded with many green elements, like a hybrid engine, solar panels and a lot of high-tech systems that makes this bus a hippy's Pimp My Ride dream come true.